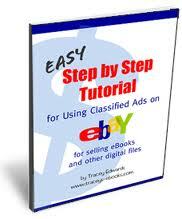 Beginners Guide To Selling Digital Items On Ebay! Is one of the most useful pieces of information I have come across. Its a step by step guide to gaining a very large contribution to your affiliate marketing efforts. I used it with great success and continue to do so to this day. In fact I would have struggled to get the ball rolling with out it. If you are just starting out or if you would like to try some other methods to market your products. This little gem is a god send!